Originally built during the old Tang dynasty (618-907), the Xian City Wall was extended by Zhu Yuanzhang, first Emperor of the Ming Dynasty (1368-1644), thus creating the modern Xian City Wall. It's the most complete city wall that has survived in China, as well being one of the largest ancient military defensive systems in the world. The wall stands at 12 meters tall, 14 meters wide at the top and 18 meters wide at the bottom. Covering 13.7 km, the wall's 4 sides each have their own complicated gate structure designed to withstand enemy attack. 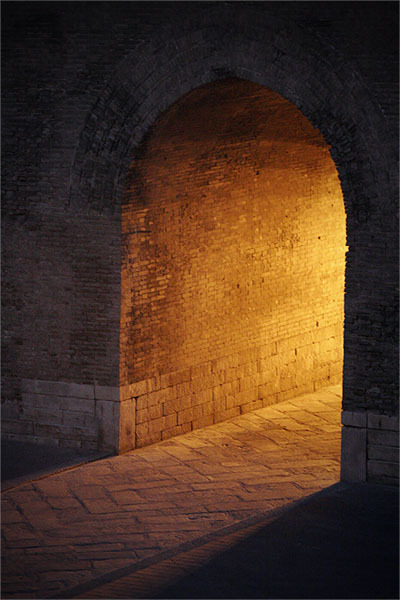 Pictured is the entrance to the east gate (Changle meaning eternal joy).